The Northshore Fire Department is an authorized Red Cross training site and offers a number of courses that are delivered in both public and private settings. 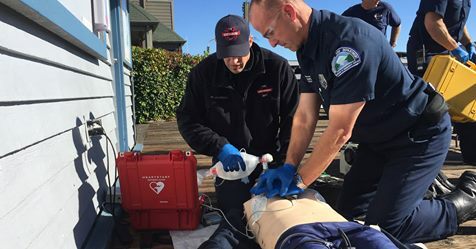 Their next Community CPR/AED class is Wednesday, June 13, 2018 at at the Kenmore fire station 7220 NE 181st St from 6:30 to 9:00pm. Visit the website for details and to sign up now! This CPR course is designed to provide lay rescuers the fundamental skills and confidence to perform CPR on an adult. This course will teach participants how to recognize and alleviate airway obstructions, the proper use of an AED (Auto External Defibrillator) and the signs, symptoms and corrective action for a stroke or heart attack. A course completion certification e-card will be provided to those who successfully complete the course. This course is recommended for the general public and is scheduled once each quarter for the public.